#15 Terriers will take the ice tonight against one of the two ranked teams they’ll face this weekend, hosting #17 Rensselaer in a 7:30 start. 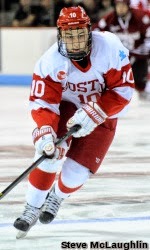 Saturday’s opponent is #2 Wisconsin in the Terriers first Big10/Hockey East Challenge game. The Engineers, one of the favorites for the ECAC title, came on strong last season winning nine of their last ten regular season games to finish second before falling to Brown the playoffs. They are led by a trio of junior forwards, Matt Neal, Jacob Laliberte and Ryan Haggerty. Goaltending may be a question as incumbent starter Jason Kasdorf was injured in practice this week. The top two scorers on BU’s 2011-12 squad, Alex Chiasson and Matt Nieto, faced off in the NHL last night as San Jose—seeking to remain undefeated—visited Dallas. With the score tied at one in the first period, Nieto turned on the jets and then blasted a shot past the Stars’ Dan Ellis. The Sharks led 3-2 midway through the second period when Dallas converted the rebound of a Chiasson shot to knot the score. Following a scoreless third and OT, the game went to a shootout with Chiasson notching the only goal to give Dallas a 4-3 win. ► The Terrier Hockey Fan Blog now has 100 Twitter followers. BU’s road trip continues with a pair of games in Western Pennsylvania against Robert Morris of the CHA. The Colonials have won three of the first four games, splitting a pair with Rensselaer and sweeping Bemidji State.